Following the very popular Last Hurrah of the Season event, an opportunity has been taken for some infrastructure improvement works to take place before our Santa services begin. GCR has been delighted to host a training and experience exercise this week where contractors have completed the "plain lining" of the carriage siding on the Down (west) side of the line. This siding is now disconnected from the main line and will be reconnected as part of improvements to the track layout at Rothley in the future. 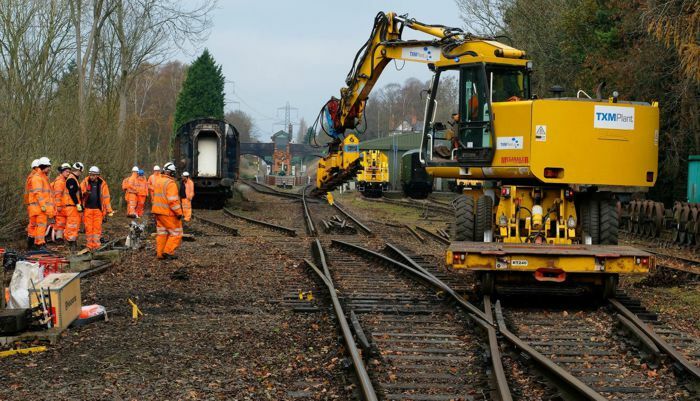 The vehicles remaining within the siding have been carefully selected as those which are not in the short-term restoration queue and will not require to be moved until after the siding is connected. A road-rail vehicle in action as part of improvement works at Rothley. Photo: Graham Wignall. The work is an example of how GCR works with the railway industry to achieve a mutual goals of achieving infrastructure improvements while also providing valuable training for industry professionals.